The Y&R Update Friday 10/1/10--Canada; Monday 10/4/10--U.S.A.
Phyllis, who is home, in her robe, calls out for Jack. He, who's partially dressed, comes in from the kitchen, and asks how she feels about the two of them being more than friends. Phyllis tells him that there's only one way to find out, and they begin kissing. Phyllis smiles, and tells him that she's kind of okay with what's happening, when there's a knock at the door. Jack excuses himself to get the coffee, while Phyllis opens the door to Skye, who barges in. Skye offers Phyllis a deal  she'll set up an account at the Newman fund in Phyllis or Summer's name, if Phyllis will print a retraction on the story about Skye and Jack's affair. Jack walks back into the living room, and asks why Phyllis would do that, when it's true. He walks over to Phyllis and hands her a cup of coffee. Skye accuses Phyllis and Jack of setting her up, so Phyllis would have something to publish, and they could humiliate Adam. Jack says he slept with Skye because she's beautiful and provocative, but Skye isn't buying it. She says she's back at the top of her game, and tells him to watch out, then leaves. After Skye is gone, Phyllis says that she wishes she actually had thought about setting Skye up. Jack says he did, and tells her about the plan he and Victor put in motion to withdraw their funds from the Newman Fund at a certain time, so it will collapse, and Adam and Skye will have to sell their assets to make up the difference. Phyllis says Jack could lose his investment, but he tells her that he and Victor plan to short the opposite position to make money for themselves, and the other people they encouraged to invest. Phyllis is impressed, especially that he's working with Victor to do this. Phyllis then asks what's going on with Skye. Jack says Skye is interesting, but not as interesting as Phyllis is. He takes off his shirt, and they lie down on the couch, and make out. Sharon walks into the Athletic Club, and into Adam. He stops her when she turns to leave, and tells her that the affection that she saw him showing to Skye the other day was an act, and that Sharon still has his heart. Sharon yells at him that she doesn't want his heart, or to have anything to do with him. Later, Sharon is leaving the bar with a bottled water, when Adam approaches her again. He says Sharon wanted to help him the other day, when he was at her home. Sharon tells him that she wants to help dogs she finds on the streets too, but sometimes she knows they're dangerous, and that she has to stay away. Adam tells Sharon that those aren't her words, but Victor's Nick's and Jacks. He says that they tell her how to feel, and think, but she needs to listen to her own heart, because she knows she has a connection with him. Sharon glares at him. Noah and Nick are at the coffeehouse, talking about Adam and Sharon. Noah says he can't believe Adam is walking free after framing Nick, and is concerned for his mother having to run into him all the time. Nick says that he's glad Sharon has Noah living with her, and Noah says he's surprised that Nick isn't living there, too. Nick tells Noah that he'll be glad to know that he and Sharon will be going on a date. Noah asks a confused Nick why he thinks that would make him happy. Nick wonders what changed since the day Noah returned home, and placed bets that his parents would be together soon. Noah says he was calling it like he saw it, but he tells Nick that he's not a little kid, and that what Nick and Sharon do is their business. Noah says he has his own life, now, and if Nick and Sharon get back together, they should do it for themselves, not for him. Nick asks if Noah has his eye on anyone, but Noah again says he's just telling Nick that he's doing his own thing, and that what Nick and Sharon do won't affect it. Nick smiles, and says he's the 'same old Noah.' Noah asks if that's a good thing, and Nick says of course; that Noah is direct and honest, just the way Nick likes it. Noah says he's not trying to give Nick a hard time. Nick says that he watched Victor and Nikki break up and get back together lots of times, and, is still dealing with it. He knows it's not easy. Noah says that he got over it, but hopes his sisters won't have to go through what he did growing up. Nick knows Noah went through a lot growing up, especially in the past few years, but he hopes he and Noah can be a family again. Jeffrey is sitting at the bar, when a man sidles up to him, and places a bet on a football game, then gives him an envelope, and leaves. Gloria walks in, and asks Jeff what that was about. Jana is inside Crimson Lights, and starts out to the patio, but stops, and eavesdrops at Kevin and Chloe, who are already out there. Chloe is ranting about Ronan being sent back to Genoa City. She says no one in town wants him around, except Nina, which she doesn't understand. Kevin tells Chloe that Nina is doing what Chloe should, and accepting that Ronan and Chance were only doing there job, and Ronan shooting Chance was....Chloe interjects that it was murder. Kevin says no, it was an accident, and blaming Ronan isn't going to make Chloe feel better, or bring Chance back. Chloe says nothing will make her feel better. Kevin tells Chloe that his situation with Jana isn't the same, but that both of them need to move on. He takes Chloe's hand and says Chance is gone, and would want her to be happy. Kevin suggests going to the Harvest Festival, but Chloe is still upset; she says that she and Chance had their first date at the Harvest Festival. Jana, who's sitting near the patio doors is shown listening in, as Chloe says the Harvest Festival isn't for her. She didn't want to go with Chance, and she definitely doesnt want to go without him. Kevin thinks she should go anyway, because she'll have fun. Farm animals, hayrides and plaid aren't her idea of fun. Kevin wears her down, promising to milk a goat, and she agrees to go, so she can witness that. Kevin then gets a phone call from Jeff, wanting him to come to Gloworm, immediately. Kevin says he's busy, but Jeff, with Gloria standing behind him, tells Kevin that his boss doesn't care if he's busy. Kevin hangs up, and tells Chloe, he'll meet her at the festival. They leave. Jana looks out onto the Patio, then turns, and runs into Noah. They both compliment each other on looking well, and Kevin says Abby texted him about Jana and Kevin's break up. Noah says he's sorry, and that it's Kevin's loss. Jana says it was horrible for both of them, but she's putting it behind her. Noah says if she ever needs anything to let him know. Jana says that Noah could help her, by going with her to the Harvest Festival today. Noah smiles. Kevin and Gloria sit at a table at Gloworm, and Kevin goes over the books while Jeff stares at them from the bar. Kevin tells Gloria everything looks fine to him. Gloria glances at Jeff, then strokes Kevin's face and tells him she doesn't know what she'd do without him looking out for her. She tells Kevin he's a good son, and walks away. Jeff walks over to Kevin, carrying a gift bag. Kevin tells Jeff that he's not doing a good job, because Gloria is already suspicious. Jeff points out that Kevin has put her mind at ease. Kevin wants to know how the gambling racket works. Jeff says that the odds come out of Vegas, and Jeff collects the betting slips, then pays the winners, collects from the losers, and keeps ten percent, with the rest going to the boss. Jeff tells Kevin that he's the one who will be delivering the ninety percent to the boss. Kevin's adamant that he won't do it, and says he agreed to take care of the books, not being a bag-man. Jeff says Kevin will get a bonus on top of his cut if he makes the delivery, which will help with buying back Crimson Lights. Kevin sighs, and talks about working hard at his business, then losing it all when Ryder ran. Jeff says playing by the rules doesn't pay. Kevin agrees, and says he'll do it. Jeff tells Kevin to go to Jimmy's, and look for certain signs, such as a coat left on a bench, and a cigar in an ashtray. If those things are there, Kevin is to leave the gift bag in the booth, then place a phone call to Jeff from a pay phone. Kevin asks why everything is so secretive, and Jeff says that he doesn't ask questions when there's this much money involved. Kevin looks into the bag, and sees that it's filled with stacks of $100 bills. Kevin smiles and says that's a lot of money. Jeff laughs and says that it's just the beginning. Sharon pushes past Adam, as he again tells her to admit they have a connection. 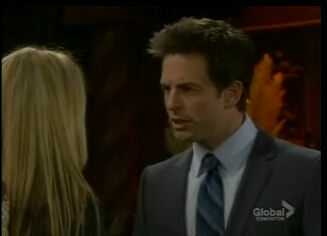 Sharon tells him that she doesn't want to be around him, as Nick walks up and takes Sharon's side. Adam says Nick is coming to the rescue again, and asks him where his cape is. Nick tells Adam to get lost. Adam tells Sharon that they'll talk later, and he leaves. Nick asks if Sharon is okay, then says he's waiting for Summer to be dropped off, from her sleep over, because they're having breakfast together. Sharon asks if they're still going to the Harvest Festival together, and tells him that she and Faith are looking forward to it. Nick agrees to meet her when it's time to go, and he and Sharon go their separate ways. Adam, who's been listening in, steps out from behind a doorway. Summer arrives, and she and Nick start out the door, and meet Skye, who's walking in. Skye says hello, and Nick tells Summer that they need to hurry up, because he promised Phyllis he wouldnt keep her out, long. Skye tells Nick not to rush getting Summer home to Phyllis, and smiles and say 'never mind' when he asks what she's talking about. Skye goes upstairs, and makes a phone call, looking for some high stakes action. She tells the person that she'll put her own game together, since the person can't find one. As she hangs up, Adam walks in, and asks who she was talking to. Adam sits down at the computer, as Skye tells him she was talking to an investor, and tells Adam he could contribute some investors, too. Adam says he brought in the Newman name, and that's enough. Skye and Adam have a short argument about her investing in a company that he thought was too risky, and Skye tells him to get lost. Adam harshly says he's sick of people telling him that, then calms down and says he's just tired, then suggests that they go to the Harvest Festival. Adam is in casual clothes, and calls to Skye to hurry up so they can go to the Festival. She comes out, wearing a little black dress, and wrapped in a fur. Adam comments on her being overdressed, but Skye says if she has to walk through manure, she's going to do it in style. Gloria is straightening up tables at Gloworm, when Jeff walks in. Gloria tells him that she doesn't care what Kevin says, because she knows something isn't right. Jeff tries to get out of it, but Gloria has seen the Fenmore's gift bag. Jeff covers that he bought her something, and Gloria gets excited, but, suspiciously asks why Kevin left with her gift. Jeff gets a phone call, and Gloria leaves. The call is Kevin. From a payphone, he tells Jeff that he left the money on the bench, but didn't see anyone. Jeff tells him to make sure the bag is gone, then check for his bonus, and leave. Jeff hangs up, then places a call to Fenmore's, and places an order with Lauren to be delivered to Gloworm. Kevin enters Jimmy's and finds his cash bonus under a centerpiece on a table. He pockets it, and leaves. Noah and Jana play a carnival game at the Harvest Festival. He tells her to stand back, and tosses a ball, at a stack of milk bottles, and misses. Jana wants to try, and Noah, in a British accent, jokes about 'limeys' not knowing anything about baseball. Jana throws the ball, and knocks over the bottles. She tells him that she learned by playing Rounders in girls' school in England. She wins a large stuffed animal, and they walk away. Noah jokes that he can't believe a girl beat him, and Jana asks if Eden let him win all the time. Noah asks if Jana had to bring her up, and says he's nervous about running into Lauren and Michael there, but figures he will, since they always come to the Festival with Fen. Noah says he broke up with Eden, so he's avoiding them. Jana says she knows the feeling, and says Michael and Lauren probably hate her after what she did to Kevin. 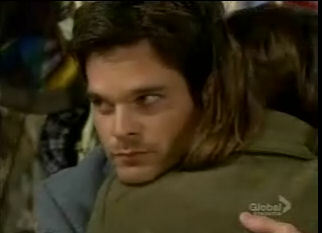 Noah suggests not talking about their exes, and tells Jana that it's sort of strange that they're hanging out. Jana thinks it's nice. She then spots Chloe, who's just arrived, and asks Noah if he'll go get her a caramel apple. He agrees, and goes to get it. Jana goes, and waits behind a booth, then as Chloe passes her, she pops out, and pretending that she hadn't noticed Chloe earlier, greets her. Jana asks if Chloe is alone, and when Chloe says that she's meeting Kevin, Jana gets an unhappy look on her face, but quickly smiles again, and goes on at a frantic pace, about festivals being called fetes in England, and the Americana feel of the one they were at, and Chloe being overdressed. Chloe says she doesn't do plaid, and talks about going to the festival with Chance last year. Jana says it must be awful for Chloe to be there alone. Chloe tries to say she won't be alone, but Jana cuts her off, and without letting her get a word in, starts talking about wanting to cheer Chloe up, and suggests they get lunch, and hang out. Chloe puts her hand up, to quiet Jana, and says she'll pass. Jana says she hasn't had a girlfriend since Amber left, and Chloe tells Jana that they're not friends and never will be, then walks away. Jana catches up to Chloe, who's trying on hats, and apologizes about pushing her. Chloe says that as Kevin's friend, she doesn't think it's a good idea to hang out with his ex. Chloe chooses a hat. Jana understands, but says that since they all live in the same town, and Jana works at Delia's school, maybe they can be civil. When Chloe agrees, Jana suggests they have tea together. Chloe tells her to have a nice day, and tells her that's being civil. Chloe leaves. Kevin arrives, and teases Chloe about the hat she bought. He picks up a cheese wedge hat, and tries to get her to put it on, but she gets angry and lashes out at him. She then calms down and tells him that Chance bought her one last year. Kevin apologizes, and hugs Chloe. Noah arrives with Jana's caramel apple, and she takes it, but seems distracted. She notices Kevin and Chloe hugging, then holds the apple for Noah to bite it, and begins to bite it at the same time, while making eye contact with Kevin. Kevin and Chloe walk up to Noah and Jana, and they have an awkward conversation. Kevin asks if Jana is seeing Noah, and they let him know that they're friends. Noah receives the same answer when he ask about Kevin and Chloe. Kevin says he heard about Noah and Eden's split, and Noah brings up what happened with Ryder, Daisy and their aunt. Jana says they're all moving on, hopefully to a point where everyone can get along. Later, Kevin and Chloe are leaving the festival when Jana calls out to them. She asks Chloe's opinion on the hat she's considering, which is the same one Chloe bought. Chloe puts on her own hat, and says she thinks it looks good on herself. Jana claims not to have realized Chloe purchased the same hat. Chloe is disbelieving, and tells Jana that she was there, when Chloe bought it, and suggests another hat would look better on Jana. She and Kevin leave. Jana says she likes the hat, and asks Noah if he thinks it fits her style. Noah says not really. Jana snaps that she's changed, and Noah doesn't know her. She buys the hat, anyway, and tells Noah she's leaving. He offers her a ride home, but Jana says she can take care of herself. 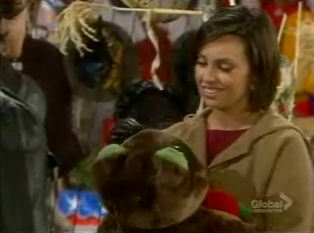 She hands him the stuffed animal she won, and walks away, leaving him looking confused. Phyllis and Jack are dressed again, and he suggests that now that they've made love twice, and spent the night together, they should go on a date. Phyllis invites him to join her and Summer at the Harvest Festival, and Jack agrees. Just then, Nick and Summer arrive, and Phyllis lets them in. Summer is thrilled to see Jack and goes running to him, and he picks her up, as Nick stares at Phyllis. Phyllis sends Summer upstairs, then Nick asks if Phyllis and Jack had a sleep over, too. Phyllis asks Nick where he slept, and he says he's not the one bouncing from relationship to relationship. Phyllis says no, Nick only does that while he's married. Nick asks to talk privately, and Jack leaves, saying he'll pick Phyllis up later. Nick sighs, as he watches them kiss goodbye. Nick says he thought Jack was with Skye. Phyllis asks if that's what he wanted to talk about, and Nick says he doesn't want Summer to be confused. Phyllis says Nick's bouncing between her and Sharon for Summer's whole life would be the thing that confused her. Nick says he wants the two of them to agree to always put Summer first, and Phyllis does. Nick says he'll see Summer next week, and leaves. Phyllis yells up to Summer about going to the festival with Jack. Jack returns to Phyllis' house to pick up her and Summer. Phyllis and Jack kiss, and Phyllis asks if he ever thought they'd be back at this point again. Summer runs downstairs and greets Jack. Jack asks Summer if she knew that he was the first person to see her after she was born, and promises to win her a prize at every Festival game in honor of that. Phyllis and Jack joke about who'll win more prizes for Summer. They leave. Nick arrives at Sharon's to pick her and Faith up. He has a bouquet of daisies for Sharon, and a toy flower for Faith. Nick tells Faith that she'll receive a real flower someday and pull off the petals, doing the 'he loves me, he loves me, not' game. Sharon tells Faith to stop on he loves me and smiles at Nick. Nick, Faith, and Sharon arrive at the festival, and joke about Faith learning to drive a tractor. Nick then makes animal noises to amuse Faith, and while he's in the middle of one, Sharon playfully sticks a hotdog in his mouth. At the festival, Jack wins a toy for Summer. Phyllis tries her hand at a game, but loses. Jack tells Phyllis that he and Summer love her anyway, and they all hug, then go to get cotton candy. Adam and Skye arrive at the Festival and she whines about stepping in manure, and having to be there. Adam says she told him to find investors, and that's what he's doing. Adam puts his arm around her, as they walk, and through smile, Skye tells him to let her go, but Adam won't as he says she told him they have to keep up appearances. Skye is complaining, and wondering who would come to such an event, when she turns, and spots Nick, Sharon and Faith. Just as Nick and Sharon see Skye, and Adam, Phyllis, Jack, and Summer walk up. All the adults stare uncomfortably at each other. Gloria walks up to the bar, and finds Jeff counting money. She comments on how much they made, and he tells her that she gets the credit, as the one who came up with the concept for Gloworm. He then pulls out a diamond encrusted pendant on a gold chain, and puts it around her neck. Gloria asks again about the bag she saw Kevin leaving with, and Jeff covers by saying that he'd bought another necklace, that was broken, and Kevin returned it. Gloria smiles, and apologizes for doubting Jeff. She gives him a hug, as he stares past her, and at the money laying on the bar.